(Oklahoma City) Sept. 17, 2013 - State Superintendent Janet Barresi recognized five Rising Star Teachers from across the state during Tuesday’s state Teacher of the Year Ceremony. Rising Stars are teachers who have been in the classroom seven years or less but who show an amazing amount of promise in their profession. 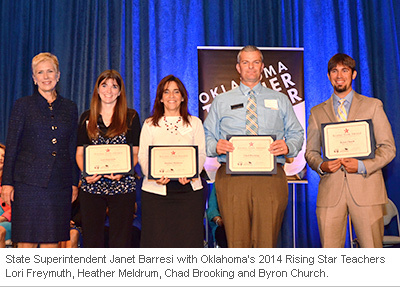 Rising Stars were named a Teacher of the Year for their district. They are selected based on portfolios reviewed by the Oklahoma Teacher of the Year regional selection committees. The judges are made up of award-winning teachers, past Teachers of the Year and past finalists and PTA members. Rising Star winners don’t know they’ve been selected until the day of the Teacher of the Year ceremony. In addition to recognition at the Teacher of the Year ceremony, Rising Star Teachers each receive more than $1,000 in cash and other prizes from the Masonic Charity Foundation of Oklahoma, the Oklahoma Schools Insurance Group, the Oklahoma Education Association, Professional Oklahoma Educators, SMART Technologies and the Oklahoma Historical Society.